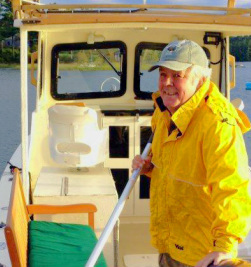 Captain Steve has cruised the coast of Maine for work and pleasure for more than 30 years. Born and raised in Maine, Steve is an avid outdoorsman equally at home on the water along the coast or in the big woods of northern Maine. He is skilled with many different types of boats ranging from sea kayaks and skiffs to the 24' lobster yacht that you will cruise. He spent more than 20 years designing wilderness camp sites for the Maine Bureau of Parks and Lands on coastal islands along Maine's entire coast. This experience allows us to show you the wilder and more secluded coves and inlets-we get you close to nature! Captain Steve's boating experience is not limited to Maine. In 2015-16 he and his wife Libbey made a 6,904 mile circumnavigation of the eastern half of the U.S.on the route known as America's Great Loop. Loop Blog He has boated in all the east coast states and maritime Canada, Alaska, the Marshall Islands, Belize and Nicaragua where he spent a few weeks training sea kayak guides for a conservation organization. He regularly trailers his boat to the Florida Keys and Everglades for a few weeks of live aboard fishing and cruising in late winter. Four seasons (2008-10 and 17) as a wilderness saltwater fishing guide in Alaska's Tongass National Forest helped Steve realize how much he enjoys taking folks out into nature on a boat and honed his halibut catching skills. Working with 200 or so cruise ship visitors each season provided great experience with guests that varied widely in age, outdoors knowledge, physical condition and fluency in English. Laughing Gull is a 24' Seaway down east lobster yacht, the type of craft often seen at work and play all along Maine's coast. She was built in 2013 with many custom features to provide the perfect trip for you. Powered by modern 4 stroke outboards (a main engine and an auxiliary) she is comfortable and safe with safety equipment that exceeds Coast Guard regulations. Electronics and navigation equipment are first rate with redundant systems for back up. A sliding cockpit roof and windowed curtains can be quickly deployed to provide cozy shelter should our trip encounter a little rain. Being "green" is an important commitment to us. Read more!